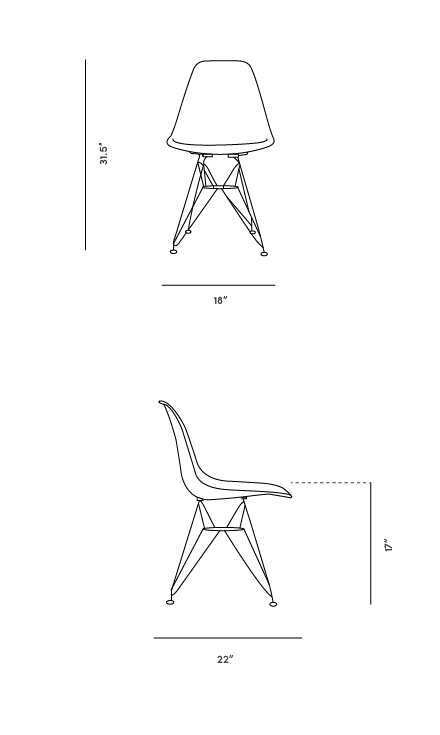 The DSR Chair is a slight adaptation of the original DSR Molded Plastic Side Chair. It has the same distinctive organically shaped polypropylene shell and Eiffel-tower inspired base, yet has a slightly simpler silhouette, making it ideal as a dining chair or side chair. The design naturally fits the contours of the body and will complement any living room or office with ease due to its iconic and timeless style. Solid build, easy to assemble. Modern and comfortable to sit on! Great array of colours to choose from. Built well. As expected. Good price. So far so good.